Long before mistaken-identity cartoons like Chuck Jones’ Forward March Hare (1952) and Jules Feffeir/Gene Deitch’s Munro (1960), was Frank Tashlin’s 1946 book The Bear That Wasn’t. Tashlin has inferred that the book was written as a reaction to his experience at Disney in the late 30s. I suppose if you think of Tashlin as the bear, with “bear” being a metaphor for an “artist”; the factory as the Disney studio; the Zoo as an art museum; the company president as Walt… it begins to make even more sense. The book was a critical and financial success, but despite his background in animation (or maybe because of it) Tashlin resisted letting the book be adapted to film. However he did oversee his own adaptation of the material, a 1947 MGM recording of the book, read by Keenan Wynn (son of Ed Wynn, and an acclaimed actor himself – and villain “Alonzo Hawk” in numerous Disney live action movies). Robert Welch adapted and directed – Welsh was a close associate of Tashlin’s at this time, having co-wrote the feature Variety Girl and later Son of Paleface with him, acting as producer of that classic and several other Tashlin features in the 1950s. Walter Schumann (Dragnet, Night of the Hunter) wrote the music for the record – and it’s an interesting coincidence that the record and Chuck Jones’ film (20 years later) were both made for MGM. Mike Kazaleh has uploaded his copy of the recording (and the humorous – probably written by Tashlin – liner notes here) and I’ve embed it below. You just wonder what Tash would have done had HE tried to animate it.It would ‘ve been an interesting experiment from one who by that point was fully into live action.I’ll bet if Tash had stayed in animation,his work would’ve achieved the status of a John Hubley or Norman Mclaren. We’ll always have to wonder that Andy, I’m still surprised he was convinced Chuck could do it after seeing The Dot and The Line. He really should’ve stuck his neck in more than to leave it all to him had it known what was going to happen. Sounds like illustrated radio there, Chuck. Jones might also have fared better with the story if he had done in at Warners in the 1950s. While you could already see a few warning signs by 1958 or so, the explosion of over-design in Chuck’s cartoons really didn’t arrive until the 1960s (possibly coinciding with Mike Maltese’s departure to Hanna-Barbera). Tahslin’s story really didn’t require the detailed, full animation of the 1940s, since it’s both very verbal and repeats the same refrain, in order to establish the idea of mindless corporate group-think. So Jones’ paired-down animation and stylized designs of the post-1953 period would have worked. But by the 1960s, his cartoons (especially the one-shots) seemed to overdose on Maurice Noble’s designs, in part to compensate for the lower animation budgets and sparser post-Maltese stories. He didn’t have to do that using Tashlin’s book (and Spector already had helped Chuck with the adaptation of “How the Grinch Stole Christmas” so they both could work together). But by 1967, apparently couldn’t help himself from having Noble’s designs smother everything else on screen. Oh man, the debate around this one never ends does it? I do find it rather fascinating, however. So that’s why Tashlin hated it, huh? I guess this is a lesson to be more involved in the adaptations of your work (if you can, that is). I didn’t find the bear’s “smoking a cigarette” too bad, if I may dispute the creator. It is obvious that the bear has the cigarette and a cup of coffee thrust upon him, and he carries them throughout his ordeal but he does not, in fact, smoke or drink them. Did anyone notice that he is at the Acme Company? That is something to think about Fred, surely the bear does nothing more than simply have those articles on him the whole time without really doing anything with ’em and simply caught in the moment. We can see it as a creative license that perhaps overstep the boundaries that Tashlin felt he knew of his story best. 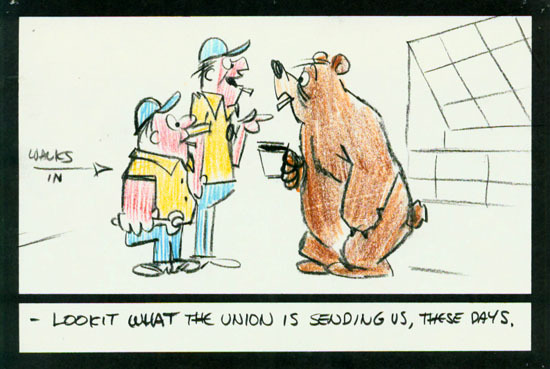 I think Tashlin thought the idea of a bear, being a pure bear (albeit a talking bear), didn’t need the additional visual props of a cigarette and coffee cup to “explain” the confusion to the factory workers and bosses. The bigger idea of the piece was that social conformity of the time didn’t recognize what was what, or who was who, even if it was obvious and standing right in front of them. Tashlin himself was a greater talent than what was needed at Disney’s factory in the 1930s – like Jones later on, they didn’t fit in with what the mouse factory was producing then. They were artists of their own. Frank Tashlin introduced his young wife, Mary Costa, to Walter Schumann, who was then attached to do the music adaptation and choral arrangements for Disney’s “Sleeping Beauty.” It was Schumann who brought Costa to Walt Disney. Schumann had heart problems and died at the age of 44 in 1958. I have to wonder why Tash didn’t get himself better involved in Jones’s production to adovid any bad ideas to happen. Even if that was the sole animation work he would do post warner. I knew Maurice very well for years, and he certainly remembered this cartoon. In fact, when I was at WB in the late 80’s Maurice requested a 35mm print of it for a screening of his work (the other cartoons were WB cartoons like Nelly’s Folly, Now Hear This, and High Note.) I have a vivid recollection of this, partly because the WB cartoons were in brilliant Technicolor, and the Bear picture was a faded “Metrocolor” print. Mike: I found it very odd when he claimed he didn’t remember it, especially since in my experience he had an excellent memory. Maybe an outfit like UPA would have handled it better. I find it fascinating in animation that there were a lot of fish out of water identity crisis motifs in that era. It’s a shame that there doesn’t seem an outlet for that kind of expression these days. I wish there was myself. Animation is capable of telling those stories surely. 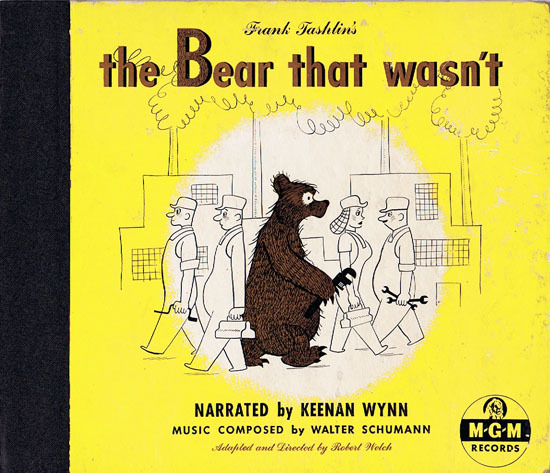 While I understand that Tashlin was terribly disappointed in how Jones’s adaptation of The Bear That Wasn’t turned out, my sympathies for him are limited. If he was really that concerned that every little detail be right, he should never have simply turned the project over to someone else and chosen to remain uninvolved. It was certainly a bad call for him to have done so. I’m sure we all would make such an honest mistake had we not known who we were dealing with in this situation. Unfortunately you sometimes trust an artist and then realize later that they didn’t share either your passion or enthusiasm. I have The Bear That Wasn’t on an MGM album, by the way. The LP also contains Drippy the Runaway Rainbow, narrated by Keenan Wynn and written by Sidney Sheldon(! ), and Fantissimo the Musical Horse, narrated by Betty Garrett. Jon, I remember The Bear that Wasn’t with great fondness from the time I was very young. My copy unfortunately was broken and I would dearly love to get a copy of it for grandchildren. Can you help me? As a child, in the 40s, we had this recording. It was a favorite of my Dad. 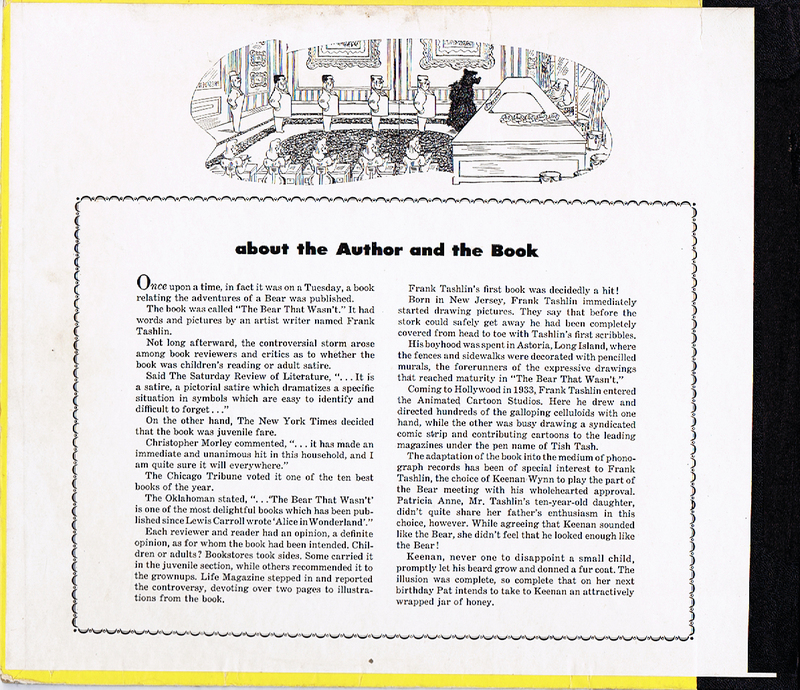 Tashlin may have implied that the book was written as a reaction to his experience at Disney, but it would have been up to others to infer it. I can’t believe I found this treasure! As a very young child I listened to that record over and over and over again and loved it. Maybe it was Wynn’s voice in part, glad to know now it was him. It’s a marvelous story. I’m about to write it out from my own memory on my blog. I never saw the cartoon version. In the 60’s and 70’s I worked for John and Faith Hubley. Hubley invented Mr Magoo after an uncle of his, and the fabulous Maypo commercials. Hubley was the assistant director on Fantasia. Their buddy Shamus Culhane (who invented Disney’s Pluto dog) was teaching animation and doing the Trix Is For Kids-Rabbit-cereal series. McClaren was animating on raw 35mm stock by hand…including scratching on, by hand, the music track! Which was fabulous. Eventually the cheap alternative to live commercials, animation, priced themselves out of the business. The Hubleys and Cullhane really loved Walt Disney. He was a rebel, breaking all the rules.. Villified for bringing classic music to cartoons (Fantasia). He kept a full library that all the animators could use, every file of original drawings and storyboards that could be checked out for reference and learning. He was an educator. Excited by his work. Intent on bringing magic into children’s lives. What’s not being considered in the discussion here is the massive number of people involved in these things before they ever hit the theatres. The herds of consultants and advisors, nervous advertisers, and the budget/finance department reps. Plus the writers, animators, artistic directors. Incredible lot of people. The job of getting an original idea in pure form into the finished product is more arduous than even a genius can often manage. Most writers have hated how their beloved work ends up on screen. I’m inclined to think Tashlin turned a blind eye and exhausted back for reasons unknown. And maybe he needed the money. What the new birds at Disney did with Beaut and the Beast deserves a firing squad. Walt wouldn’t have. You can produce independent work more easily these days but the sacrifice, except rarely, is that hundreds see what you’ve done instead of millions. Then too, when it gets to millions, it probably no longer resembles what you’ve done. Even artists have to eat. I grew up with the book (Tashlin) and record (wynn). Have an autographed drawing from a page from the book given to me in the 60s by Tashlin. LOVE it.